Long-term financial planning can be hard to visualise for most people. Who knows what’s going to happen in 10 or 20 years’ time? Heck, we won’t even know what’s going to happen next year. This is probably why people just forego investing their money and opt for instant gratification (only the strongest are able to walk away from the latest iPhone). 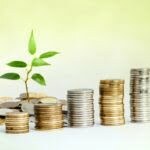 However, if you take away the unnecessary risk and put in place a proper, systematic way of saving and investing, saving for long-term is easy and your financial goals (like saving for your child’s college fund) can be achieved. One of the most obvious investment instruments that checked all the above criteria are endowment insurance plans. These kind of plans have both life insurance and investment components, because they both go hand-in-hand. If you are unable to save or contribute to the investment due to death or disability, the protection component will still help you achieve your financial goal. The premiums are used to pay for your protection and also investment. Sounds simple enough, but there are steps you need to take when choosing the right plan to fit your financial goals. A good endowment plan should offer a short premium payment term yet provide a long protection period. The maturity period should also match your financial goals. For example, if you are saving to buy a home or get married, a 20-year maturity period is probably not your best bet. Here’s a how a good endowment plan can make dreams come true for this family: Zack and his wife just had a baby and one of the biggest fund a parent needs to save up for their child is their college fund. 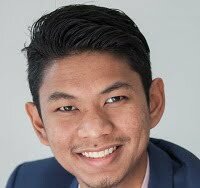 Private tertiary education does not come cheap in Malaysia, and Zack is keen to start saving for his new bundle of joy as soon as possible. 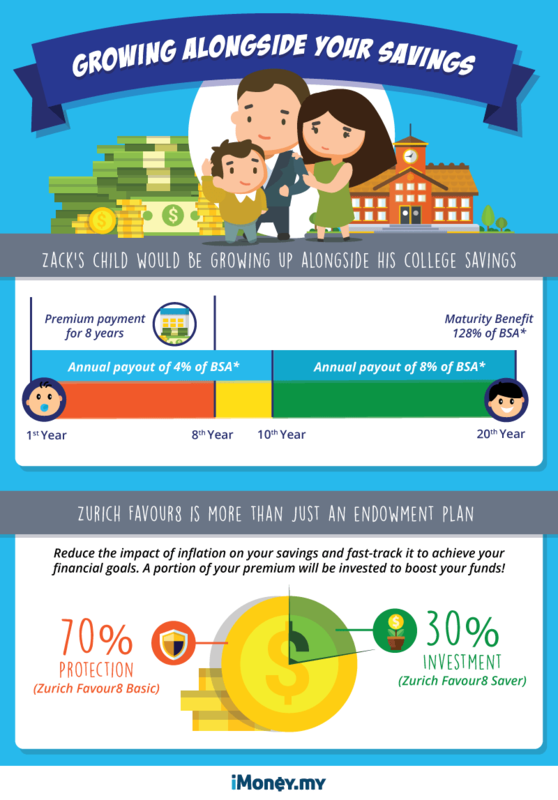 He needs a systematic way to save and invest to ensure he will have enough when his child finishes his secondary school, and Zurich Favour8 is a good option for just that. It only requires him to pay for the premium for the first eight years and yet still get the coverage for 20 years. On top of that, the product is unique in that it gives returns every year up till 20. 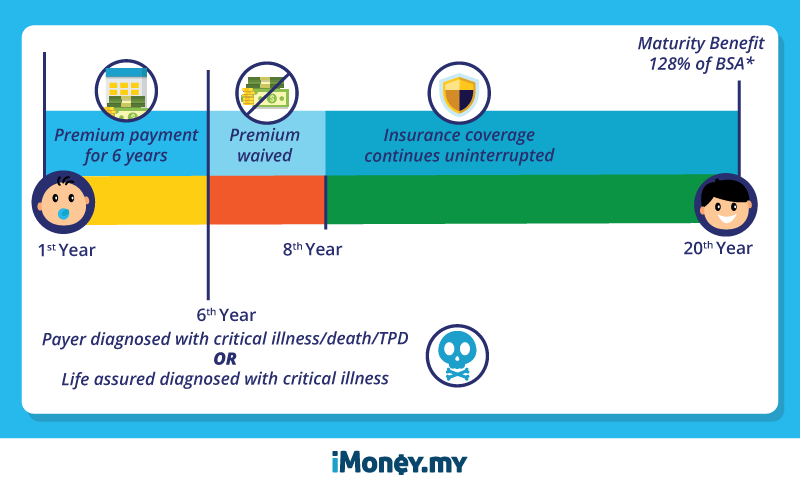 With 70% of the premium allocated for Zurich Favour8 Basic, which not only offers life protection in the event of death or total permanent disability (TPD), it also offers guaranteed cash back every policy year and maturity benefit at the end of the policy (20th year). 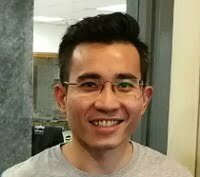 In the case of Zack, for the annual premium of RM18,565.00, his basic sum assured amounts to RM50,000. 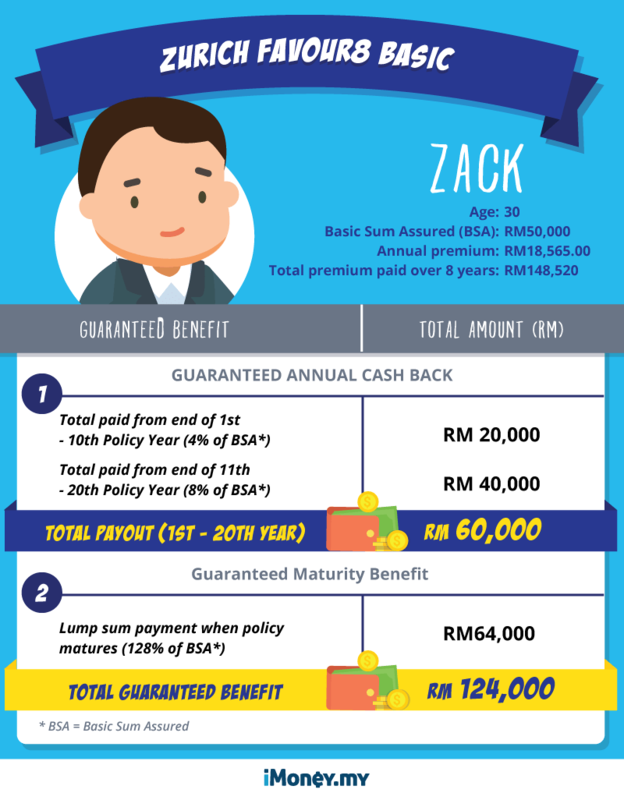 This means if Zack is met with an unfortunate event that leads to death or TPD before the policy matures, he or his beneficiary will be compensated with basic sum assured or 100% of the total premium paid for his Zurich Favour8 Basic (after deduction of any guaranteed cash back paid), whichever is higher. He or his beneficiary will also receive the investment account value, if any – which can still be used to achieve his financial goal. However, the beauty of this insurance plan is, a certain percentage of your premium is invested. Like any investments, you can potentially gain more if the market moves to your advantage. At the end of the 20th policy year, Zack can comfortably pay for his child’s college tuition fees. Here’s how much Zack could potentially gain when he reaches 50 years old, and his son reaches 20 years old. But is your plan foolproof? Lack of planning will inevitably lead you to failure. Having a plan for your child’s future is what most parents work for. 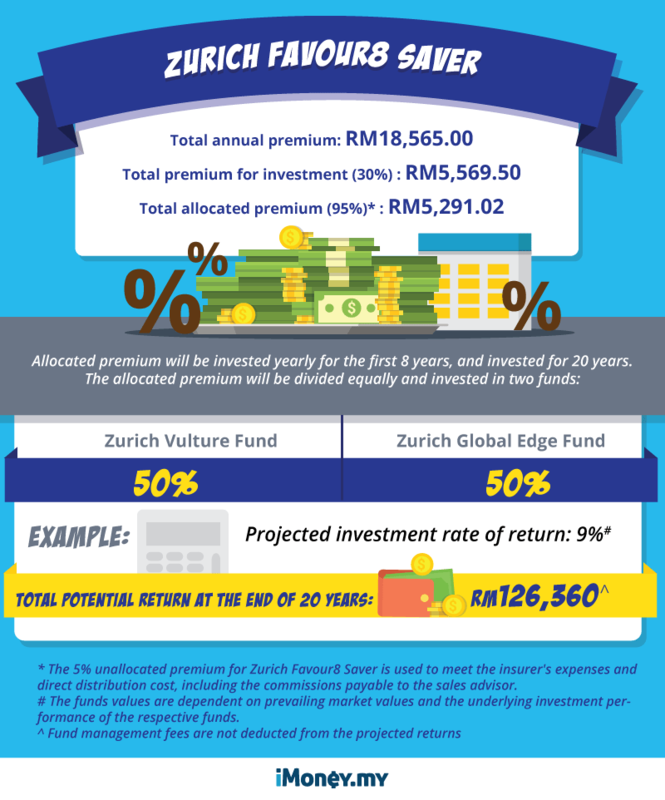 Zurich Favour8 works as a safety net – as long as you are able to fulfil your premium obligation for the first eight years. 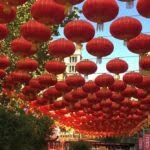 However, what if you lose your ability to generate income and you let the ball drop? Do you have a Plan B for that? 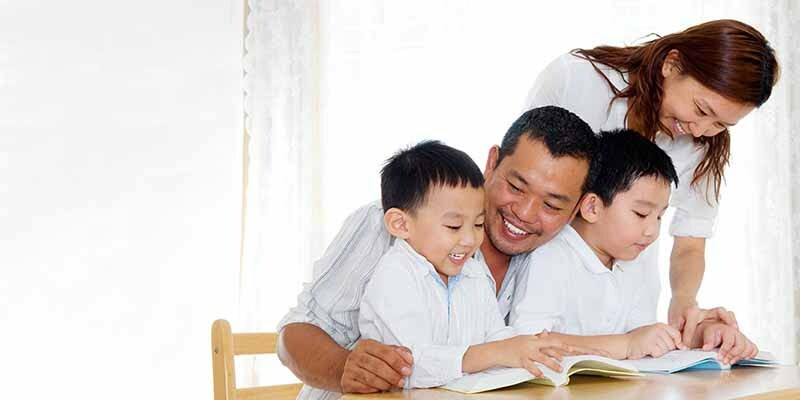 Your dependents need financial support the most when you are no longer around. 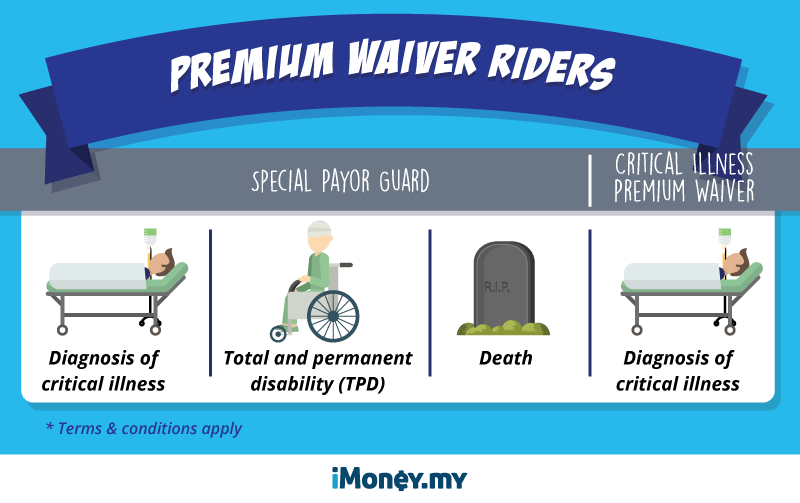 Insurance policies can be fortified further with additional riders such as premium waiver benefits for the payer. How it works is you (a parent) bought an investment-linked insurance policy to protect your family’s future, the rider will ensure that your family will still be protected if you have lost the ability to fulfil your premium obligation due to critical illness, total and permanent disability (TPD) or death. Depending on the number of children you have, paying for college can be the most expensive event outside of paying for retirement. However, it can be made easier if you make smart money decisions early on. 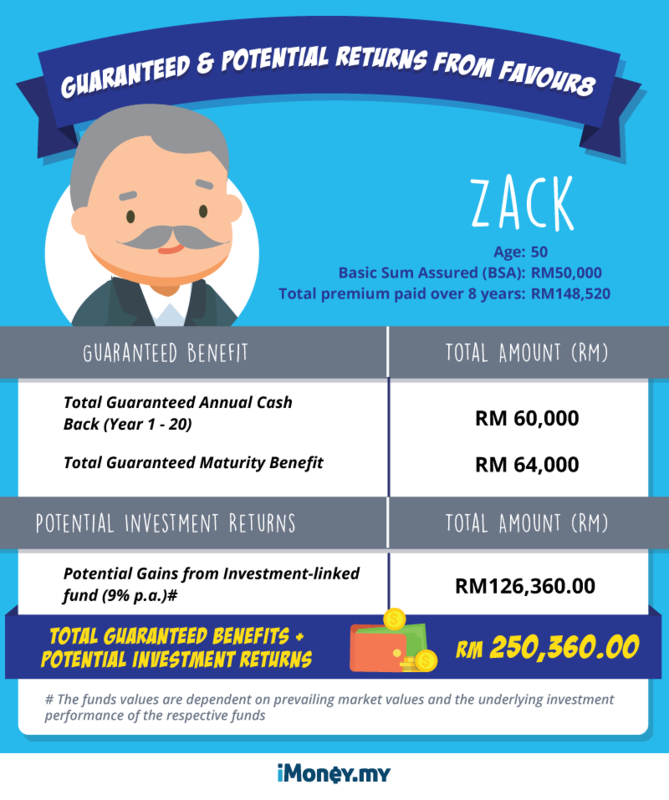 And Zack has made a wise decision by saving in an endowment plan as soon as his son is born, which allows him to systematically save for his child’s college fund for a short period of time. As Warren Buffet said, “Someone’s sitting in the shade today because someone planted a tree a long time ago.” Plant your tree today so you and your loved ones can harvest the fruits in the future.